You can pay monthly or quarterly by fixed amount Direct Debit, Cash/Cheque or Direct Debit whole amount. Paying by Direct Debit is cheaper because the unit rate is lower compared to paying by cash, cheque or prepayment. Please refer to the unit rate tool for further information. Blue+Price Protection is available to Dual Fuel, Electricity only and Gas only customers with Standard and Economy 7 meters. For more complex meter types please call customer services. This tariff is available for a limited time only and can be withdrawn from sale at any time. View your tariff details | login to My Account to switch tariff. We will notify you between 42 to 49 days in advance of your tariff end date. You’ll be able to change supplier or choose a new tariff from our other available tariffs at that time. When your tariff ends, if you haven’t either chosen a new tariff with us or notified us that you will be leaving, then you’ll automatically be transferred to our cheapest eligible evergreen tariff available at that time for your meter type and payment method. 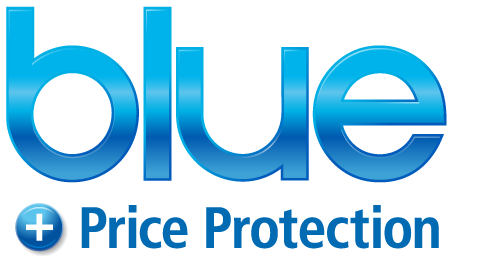 By switching to Blue+Price Protection you are agreeing to our Blue+Price Protection full tariff rules. You can access these online at any time, or request a paper copy by contacting us free on 0333 200 5100. We won't make changes to your T&C's which are to your significant disadvantage without letting you know in advance and giving you the chance to end your contract and change supplier. Whilst we have tried to summarise above the terms that we believe might reasonably be of most significant impact, all the terms within our full tariff rules are important and we appreciate that different customers may have different views as to what is of most significance to them. For this reason it is important that you read these terms and if you have any questions regarding them please let us know so we can clarify these accordingly. Your Full Tariff Rules for Blue+Price Protection are available on the Information booklet link below.